Swimming, hiking, tennis, photography, writing, dismantling the patriarchy, salsa dancing, sitting on my couch watching other people play sports. 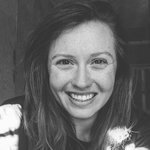 I'm an educator, writer, and swim coach starting my third year in Kathmandu, Nepal. I have a checkered history with disordered eating and body image, but have finally gotten to a mental point in my mid-twenties where I can follow a diet without spiraling downhill. Whole30 seemed like the most nutritionally and emotionally healthy choice for me! Start date Sep 3, 2018.